In Zero Dark Thirty, Jessica Chastain played a fictional CIA analyst who leads the charge to track down Osama Bin Laden. Zero Dark’s Maya is smart, tough, and appropriately stubborn, and the basis for one of Chastain’s very best performances. Elizabeth Sloane, the lobbyist title character of Miss Sloane, seems like a natural companion role: As written, she’s whip-smart, unyielding, able to effortlessly command just about any room in D.C., and, in her own way, deeply principled. Cleverly, the movie turns that last detail into something resembling a twist. It opens on Sloane testifying before Congress, then flashes back to a few months earlier and sits in on a hard-charging, cheerfully amoral briefing for her latest lobbying gig before revealing, in a subsequent scene, that she refuses to lobby on behalf of the firearm industry—simply because she is opposed to it. In a darkly funny running gag, her colleagues presume she must have known someone who died in a mass shooting. It’s the only way they can reconcile her stance with her calculating, victory-obsessed exterior. It’s easy to believe this supposed conflict coming from Chastain, who naturally projects complicated intelligence. She also has the sort of charisma that can fill gaps in underwritten roles and Elizabeth Sloane is, if anything, overwritten. So why does Chastain still feel vaguely miscast, even as she commands the screen? She single-handedly puts Miss Sloane in a tight spot: She’s the main reason it’s compelling, yet it’s not one of her strongest performances because it doesn’t call upon any of her subtlety. She dominates a talented ensemble while playing a character whose fearsome, hard-bitten cynicism paired with insomnia, prescription drug use, and patronization of male prostitutes isn’t as bracing or surprising as the movie seems to think. The main problem is a dialogue-heavy script by first-time screenwriter Jonathan Perera that mistakes quantity of verbiage for quality. As Sloane switches sides, decamping for a smaller organization led by Rodolfo Schmidt (Mark Strong) and dedicated to the passage of a gun bill closing background-check loopholes, there are plenty of opportunities for her to snap out self-confident comebacks, prioritizing her ruthless logic over emotional appeals. But the rhythms of this dialogue hold few surprises. Much of it sounds like a poor man’s Aaron Sorkin (the movie even recruits two Newsroom cast members, with Sam Waterston and Alison Pill working on the other side of the righteousness divide at the firm that Sloane leaves) but has few to none of the laugh lines that Sorkin can spring on his characters talking in same-sounding sprints. Perera’s sole improvement on the sometimes brilliant, sometimes irritating Sorkin style is his ribbing (and implicit criticism) of Sloane’s compulsion to correct her colleagues, the kind of forced one-upmanship Sorkin can’t help but worship. There’s pleasure in seeing a killer Washington instinct applied to a righteous cause, even if the dialogue doesn’t crackle, and even if the movie’s (current) fiction of congresspeople not simply voting hard on their respective party lines leaves a synthetic aftertaste. 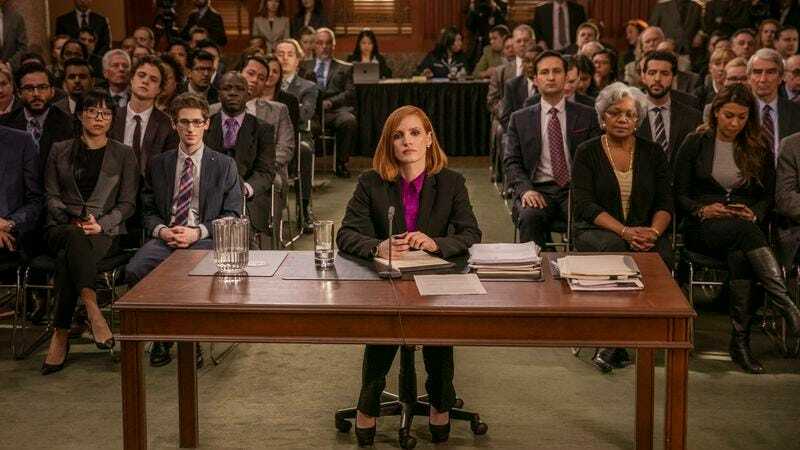 With its trickery and hustle, some of Miss Sloane resembles a David Mamet-style con-artist thriller (Chastain’s voice even sounds a little like Mamet regular/wife Rebecca Pidgeon). But it eventually indulges too much bombast to work on those more modest terms. Director John Madden (The Debt, Shakespeare In Love) does well enough capturing the modern drab of D.C. offices, all glass walls and chill color palettes, the latter seen as something of an ideal when Sloane promises to be a “granite wall” when she’s instructed to plead the Fifth. And a talented cast including Gugu Mbatha-Raw as an earnest anti-gun lobbyist and Michael Stuhlbarg as the head of Sloane’s previous employer makes the movie plenty watchable. It’s such a slickly professional production that Madden, Chastain, and company nearly distract from the soapsuds building up around them. Ultimately, Miss Sloane is a square D.C. melodrama—which would be fine if its title character weren’t designed to play it cool.